The National Garden Bureau has declared 2016 the Year of the Delphinium. -- The name Delphinium is from the Latin for "dolphin." Some long-ago botanist thought the flower's nectar-producing structure resembled a dolphin's nose. 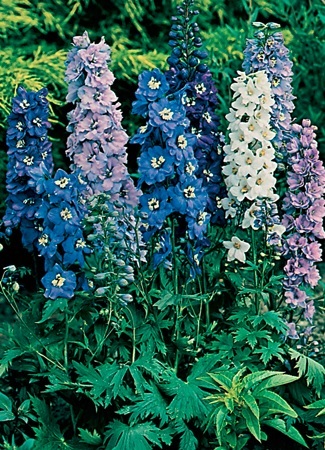 -- The hardy Delphinium shares the common name "larkspur" with annual Consolida. -- Delphinium flowers were once believed to protect against scorpions. -- In the language of flowers, Delphinium conveyed "infinite possibilities" and hope. -- All species are toxic. Please, please, don't eat the larkspur!